I can remember as a child my mom always trying to rush around and make some holiday treats for her co-workers and our teachers and never really had the opportunity to make my own until this year. Some of my friends that live far away will be getting these treat boxes. I love the design on them! I'm making quite a few items this year and will be featuring each item on a different day this week! So Stay Tuned for all the recipes! I hope everyone has a wonderful week and has all their Christmas shopping done (because I sure don't)! In a heavy bottom pan over low heat, melt all of the chocolate chips with the sweetened condensed milk and the salt. Remove from the heat, stir in the nuts, and the vanilla. Spread evenly into a foil-lined 8 or 9-inch square pan. Chill for 3 hours, or until firm. Remove the wonderful fudge you just made from the pan and place onto a cutting board. 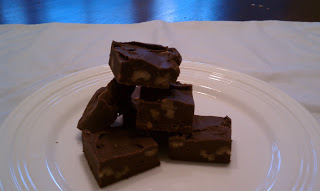 Remove the foil from the bottom of the fudge and cut into squares. 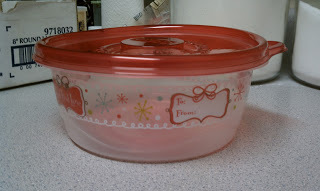 Store, covered, in the refrigerator or freezer.